Austal Limited (Austal) (ASX:ASB) is pleased to announce it has been awarded a contract from the Abu Dhabi National Oil Company (ADNOC) to design and construct two 45 metre high speed catamaran ferries. The contract is valued at approximately $30 million. 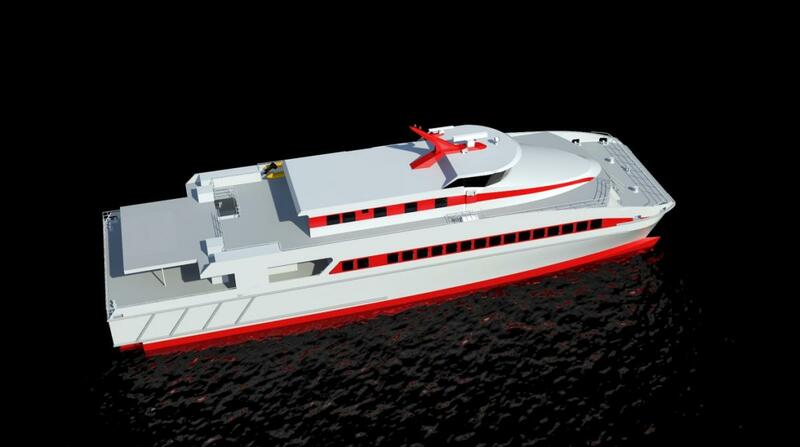 The high speed ferries will be designed and constructed at Austal’s Philippines shipyard. Construction will commence in the current quarter, with both vessels expected to be delivered in 2015. The high speed ferries will be used to transfer cargo, personnel, and equipment to ADNOC offshore installations. ADNOC is one of the world’s leading oil and gas companies, with substantial business interests in upstream and downstream activities, and steadily growing its fleet of offshore support vessels. Austal Chief Executive Officer Andrew Bellamy said it was pleasing to win the contract, which was in line with Austal’s strategy of targeting commercial vessel opportunities in the oil and gas market. “Given the subdued commercial ferry market, we have repositioned our commercial business to be more competitive and target sectors that will deliver value from the depth of knowledge Austal has in designing and constructing these vessels,” Mr Bellamy said. “Expanding into the Philippines was a key step in increasing competitiveness and we have enhanced this through the ongoing transfer of technology to the shipyard. “We also identified new and emerging markets such the Middle East and the energy sector as key targets to drive value from the shipyard. “This contract is very pleasing as it demonstrates Austal’s ability to use our deep know-how and competitive position to win work in this target market. Austal delivered an 80 metre commercial ferry to a repeat customer in December 2013 that was designed and constructed at its Philippines shipyard. Abu Dhabi National Oil Company (ADNOC) was establishedin 1971 to operate in all areas of the oil and gas industry and since then has steadily broadened its activity in establishing companies and subsidiaries and creating an integrated oil and gas industry in the fields of exploration and production, support services, oil refining and gas processing, chemicals and petrochemicals, maritime transportation and refined products and distribution. More information is available at www.adnoc.ae. Austal is a global defence prime contractor and a designer manufacturer of defence and commercial ships. For more than 25 years Austal has been a leader in the design, construction and maintenance of revolutionary ships for Governments, Navies and Ferry operators around the world. More than 250 vessels have been delivered in that time. Defence vessels designed and built by Austal include multi-mission combatants, such as the Littoral Combat Ship (LCS) for the United States Navy and military high speed vessels for transport and humanitarian relief, such as the Joint High Speed Vessel (JHSV) for the United States Navy and High Speed Support Vessel (HSSV) for the Royal Navy of Oman. Austal also designs, constructs, integrates and maintains an extensive range of patrol and auxiliary vessels for government agencies globally, including the Cape Class Patrol Boat Program for Australian Customs and Border Protection. Defence vessels are designed and constructed in Mobile, Alabama and in Henderson, Western Australia. Austal provides a wide range of support services, including through life support, integrated logistics support, vessel sustainment and systems support. These services are delivered through our global support network in the USA, Australia, Asia, the Caribbean and the Middle East together with partner shipyards worldwide.